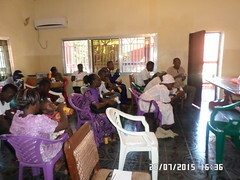 The World Mental Day Celebration in Sierra Leone was being facilitated by not only by the Coalition of the Enabling Access to Mental Health in Sierra Leone through the Australian Aid’s Mental Health Leadership and Advocacy Project and the EC sponsored “Enabling Access to Mental Health in Sierra Leone Project”, but other stake holders organizations like the World Health Organization and the Government of Sierra Leone as well. The coalition was able to facilitate the production of a Jingle which was aired in major Radio institutions in and out of the city. The goal was to raise awareness about the World Mental Health Day and the need for hearers to not only understand what Mental Health and other related issues are but also help them know appropriate approach in dealing with the different Mental Health issues. On Tuesday 8th October, 2013, representatives from the Mental Health Coalition including government officials and representatives from the World Health Organization participated in a television discussion at the National Television Station (The Sierra Leone Broadcasting Cooperation). Wednesday 9th and Thursday 10th October, 2013 saw an awareness rising radio discussion from a range of medical, psychologists as well as advocates who are part of the coalition (including the WHO) were being selected to form part of the team to get these programs actualized. The Coalition was able to engaged religious institutions during the World Mental Day Celebrations by ensuring that they do sensitization and prayers about and on behalf of the Mentally Ill. The mhLAP Sponsored Essay competition saw about forty invitees present at the final presentation phase of three qualified secondary school students’ essay competition. This very highly educative program was aimed in having students raise awareness among their peers about those very sensitive mental health issues affecting them and at the end, proffering ways such challenges could be mitigated. Thursday, 10th October, 2013 saw a great awareness raising pre-commemoration march-pass of major stake holders. With two well known brass band (among which was the police band) led members through the major streets in Freetown through to the National Stadium. Members of the coalition-shirts during the March pass did not only share posters and fact sheets with messages about mental health but also used the opportunity to inform them about best community re-responsibility in caring for the mentally challenged. The awareness raising March pass/street parade was climaxed with the formal commemoration of the World Mental Health Day. Major government and non-governmental institutions were present including the Mental Health Coalition and the World Health Organization. Speeches and statements formed a major component of the program. Each pointing at the need for a scaling up of service and support for the mentally challenged. Preceding the speech of the Hon Dep. Minister of Health iII, was a great musical and mellow-drama display by a group physically challenged persons “The One Family Group”. The Press Conference held after the commemoration Ceremony. A total of seventeen journalists were present for this ceremony. The scope spanned from the electronic to print media. The main aim of this activity was to create a greater advocacy platform for service users and providers. 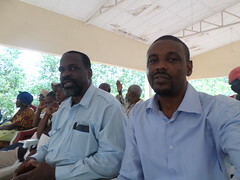 This aspect which had representatives from the Coalition, WHO and the Sierra Leone Psychiatric Hospital and the Project Coordinator EAMH-SL (City of Rest)participated in it. 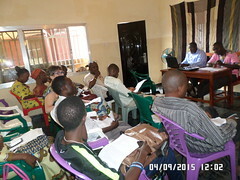 The Public Relation Officer of the Health and Sanitation was the chairman of the entire session. The Need to Promote Mental Health awareness and refutes the myths of the mentally ill.
Seek to mitigate the issue of stigma against the service users and providers. Raise awareness about the existence of the coalition, its roles and activities and strides already made. Advocate for cooperate responsibility in helping to meet the mental health needs in the country. The coalition concluded the week long World Mental Health Day Celebrations by making a memorable visit to institutions offering services to patients (the Sierra Leone Psychiatry Hospital, City of Rest Rehabilitation Centre, Hosetta Abdulai Special School for needy Children and the King Georges Home for the Aged). Process food was shared and eaten with patients followed by a moment of interaction and presentation of other food and non-food items.